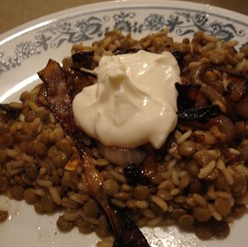 Lentils and rice on their own can be a bit bland, but throw in some browned onions and yogurt and you have mujadarrah! 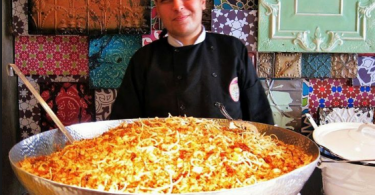 Here is a simple recipe which serves four people and takes only fifty minutes. Give it a try! Now that the ingredients are ready, it should take at least forty minutes to cook. Start off by heating some oil in a fairly large skillet on a medium heat setting. Add the onions and cook them for ten minutes or so, until they have browned. Remove the skillet from the heat. Next, place your green lentils into a medium-sized saucepan with just enough water to cover them. Add a touch of salt. Bring it to the boil, then reduce the heat and let it simmer for fifteen minutes. Now you can add the rice, top up the water so that it covers the rice and lentils and add a touch more salt and pepper to the saucepan. Let it simmer for fifteen to twenty minutes until both the rice and lentils are soft. When they are ready, drain the water. 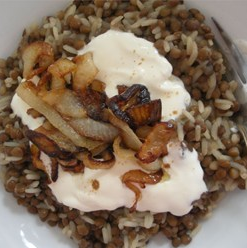 Finish off by topping your lentils and rice with browned onion and yogurt. 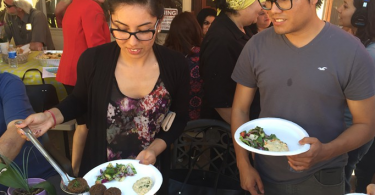 It’s just so delicious and only five hundred and thirty-five calories!